Welcome to Real Life. The son of one of my best friends is getting married in May. I've known the boy since he was a baby bump. Our families are like family. Because I know and love them well, I wouldn't miss the wedding. But, not everyone will attend. The wedding date is set. The invitations are out. The groom’s father is known and respected around the world. Wedding staff has been preparing non-stop for months. Tenor Andrea Bocelli will perform live at the reception. Chef Wolfgang Puck is creating the menu. Versace is designing the wedding attire. There is just one problem. None of the invited guests have responded. 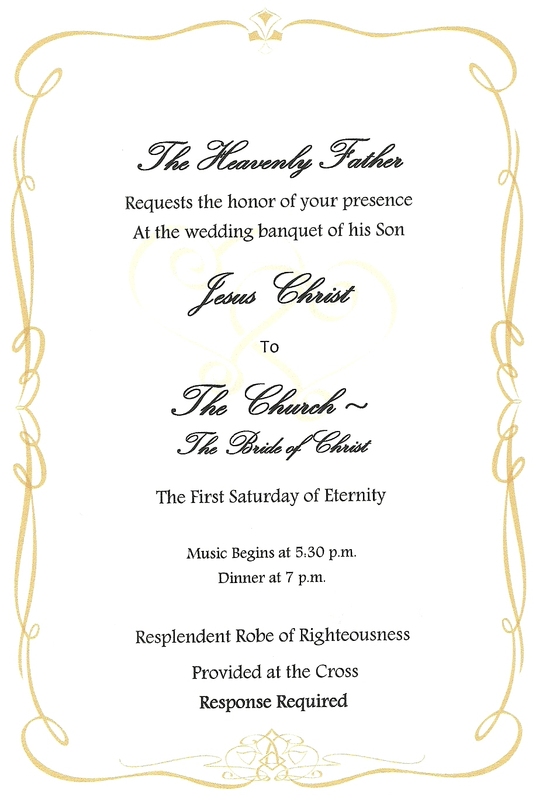 Ever patient, the father re-sends the invitations by personal messenger. Perhaps they got lost in the mail. However, this time there is no denying the snub. Doors are slammed in messengers’ faces. Some of the couriers are threatened and roughed up. Others are actually seized and thrown in prison. The groom’s father has had enough. The law is on his side. He files suit on behalf of his messengers. And those on the original guest list are fined and punished. Nonplussed, the Father continues with plans for the wedding. He calls a staff meeting and explains, “The invited guests did not deserve to come. Go into the streets and invite anyone you see.” They branch out into the city. They invite all–slick businessman, young mom with her toddler, beggar on the square, prostitute, owner of the coffee shop, college student, old woman using a walker, drug dealer–to the big event. Still, relatively few respond. The team keeps inviting. The morning of the wedding day, the groom’s father provides a spa treatment and designer evening-wear for each guest. The enormous banquet hall fills. People mingle to the sounds of a string quartet while savoring appetizers. But, then, a party crasher draws attention. His odor turns heads and spurs migration to the opposite end of the room. He’s wearing slept-in jeans, a sweat stained t-shirt, and muddy boots that track his steps. The father approaches, “Friend, why would you dishonor me by entering without the wedding clothes I freely provide?” The man is speechless. The father signals his staff and they throw the man out into the dark night. Just days before his crucifixion, Jesus tells this parable of the wedding banquet. He is spending his final week teaching and healing in the temple courts. These actions have incensed the religious leaders. Who does this Jesus think he is? What right does he have to teach here? Jesus has every right. He’s in his Father’s house. So he tells this parable, hoping these men will find themselves in the story. The groom is Jesus whose heavenly Father hosts the wedding banquet. 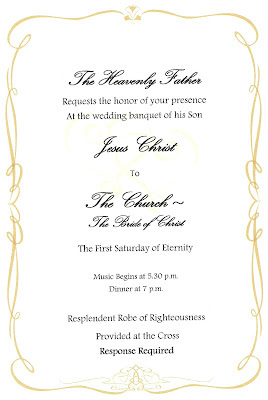 The guests on the original invitation list are the religious leaders. Though chosen to walk with God and represent him to the world, their hearts are far from him. Therefore, the Father sends prophet-messengers to invite his chosen ones to return to him. But, they ignore, mistreat, and even kill the prophets. In a last ditch effort, the Father sends his Son. These religious leaders are so blind to the truth; they fail to recognize the Son. They plot to murder him. After Christ's death, his messengers carry God’s invitation to the entire world. Come to the cross. Justice demands that sin be punished. Jesus paid the price. His blood, his tears, his pain, his death purchased our forgiveness. At the cross, we exchange our filth for his righteousness. In his robe of righteousness, we are welcomed into the wedding banquet. As promised, Christ will return for his bride, the church. The wedding celebration will be magnificent! What about me? Where do I find myself in the story? First, like the religious leaders, I’m on the original guest list. I grew up in a traditional Christian church. But, my heart was far from God. I snubbed his invitation. I was bent on going my own way. However, later, the Father sent another messenger. I was invited to a church where I heard about the cross. This time, I understood. I accepted his invitation. I knelt at an altar and surrendered my life to Jesus. Now, I know and love the groom well. I wouldn't miss the wedding. Today, I am his messenger, carrying the Father's invitation. It’s Good Friday. Will you come to the cross? Sung by Brian Doerksen on YouTube. Call 888-NEED-HIM or visit www.needhim.org. Investigate the claims of Christianity. Read Mere Christianity by C.S. Lewis or The Reason for God: Belief in the Age of Skepticism by Timothy Keller. I love Him so much and I love how you write about Him. Have a blessed Easter, Peggi. Very strong and powerful essay. The essence of God was very well-spoken. Totally loved this post. Anyways, I also am going to attend a cousin’s reception party at one of the best Chicago wedding venues. I will also be the bridesmaid for the first time in this wedding so it is super special for me. I really cannot wait for her day now. Hi, Wenni Donna. Thanks for stopping by. Your cousin's weddings sounds amazing. Enjoy your special event!